One of the new features that Call Of Duty WW2 is bringing to the series is Headquarters, a social space where players can meet up and find new missions. Think of it as a cross between Destiny's Tower and a World Of Warcraft capital cities; the more time you spend there, the better. We spoke to Michael Condrey, studio head at Sledgehammer Games, to find out more. "There are things that you can do in Headquarters that give you rewards: you can earn XP, you can earn cosmetic rewards, you can earn buffs and bonuses like double XP for doing a bunch of little challenges and things," he says. "We know we have a great community, [and] our offering to date has largely been about the competitive space - how do you do competitive - but our Headquarters is meant to be about the other aspect, the social aspect, rewarding people for being social." Introverts beware - as well as worrying about your kill/death ratio, you'll now want to keep an eye on your Call Of Duty WW2 social score too. "A KD is your competitive score; social score is about how much you contribute to the community, so people can commend you for doing cool things," says Condrey. "You can rank up your social score and get rewarded just for hanging out and being a good member of the community." There will be other perks as well, even just for being there when people are opening up the new loot boxes. "If you open your supply drops (all of our loot is cosmetic this year, so it’s just about character customization) and get something really cool, there’s a chance people watching you open your supply drop will also get something cool." Basically, prepare to have a lot of folks look at you all thirsty whenever you want to open up a loot box. 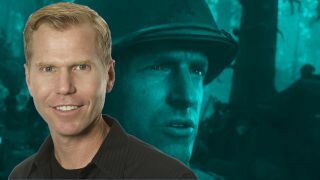 Read the full interview with Condrey tomorrow on GamesRadar+. Call Of Duty WW2 will be released on PlayStation 4, Xbox One, and PC on November 3.